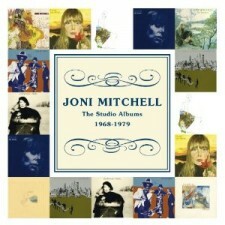 Get Me Some Joni Mitchell For Christmas! Last night, to delay my obsessive fretting about the election, I worked in a soup kitchen in an area of Brooklyn hit hard by the hurricane. As I walked from there to the subway home, I heard Christmas music from every shop facade. It wasn’t the Christmas music I like to hear: I’d rather hear Joni Mitchell sing her eloquent songs of depressiveness and and romantic abandonment. In fact, if you want to get on my good side then get me Joni’s new box set for Christmas. It would be especially nice to fill her coffers these days: The last few years have not been happy ones for Joni. Suffering from Morgellons Syndrome, a rare skin condition, she has all but abandoned music altogether. She has not performed in more than ten years, and not released an album since the stately and haunting “Shine,” five years ago – a record of melancholic reflections on the environment and mankind’s propensity for self-destruction. Once a force of life, Mitchell now seems distinctly at odds with the world. Cheer up, Joni! Millions of us still love you! All Those Rockers Who Paint: Any Good?